On the field, George Case was known for his speed. The fleet-footed outfielder led the American League in stolen bases six times, including a five-year stretch from 1939-1943. During his career that spanned 11 seasons, Case had the foresight to capture action from all of the American League ballparks onto color 8mm film. 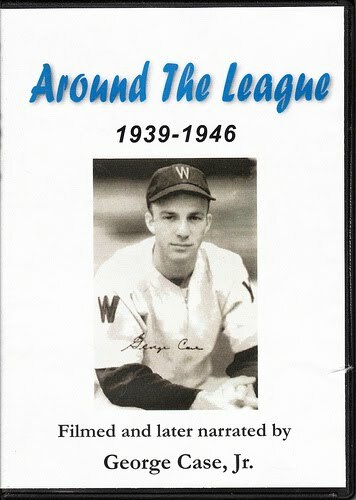 Previously silent footage, Case wisely recorded the narration before his death in 1989 that guides you through the 37 minute expedition entitled "Around the League". While Case identifies his old teammates and opponents, he makes you feel like you are sitting next to your father calmly recounting proud memories of an era long gone. There are over 15 Hall of Fame baseball players featured in this collection, and for many fans it is their only chance to see action of baseball's immortals in living color. 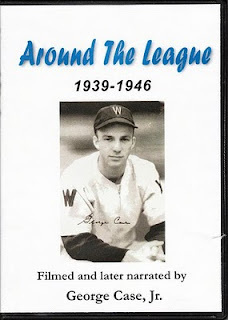 Vivid footage of such greats as Ted Williams, Joe DiMaggio, Jimmie Foxx, Charlie Gehringer and Hank Greenberg bring the descriptions that one may have read about these legends come to life on your screen. Add in Case's first hand accounts of the foregone players and ballparks, you will feel like you were there live in the flesh while Case was capturing it on his personal camera. The DVD sells for $35.95 (shipping included) and can be purchased directly from his son George Case III by emailing him at case67@verizon.net. Seems like I'm seeing this story all over the place. I wrote something a couple weeks ago for my blog (http://baseballpastandpresent.com/2010/06/11/home-movies/), Seamheads just did something, and now your site. It's good to see the film getting some attention. Nice post. Cool site, too. I wasn't previously aware of it, but I have added you to my blogroll. Thanks for checking it out. The video is really the only place you are going to see these color shots of some of the greats. It's the release of a buried treasure. I will add your blog too.